REO Foreclosure properties are often targeted for theft, vandalism and unauthorized occupation. Our door and window guards keep trouble out, no matter what form it takes. Managing a foreclosed property should never be an issue of safety. 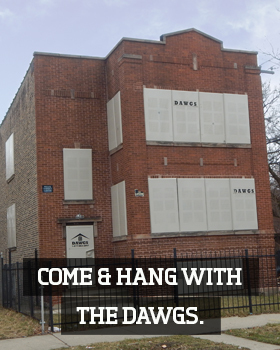 With DAWGS, your vacant property security is no longer an issue, no matter the neighborhood or the property. We work with all types of servicers, receivers, property management and bank asset managers, enabling you to quickly and easily secure your building so you can move on. A vacant building is a vulnerable one. With DAWGS on the scene, you can manage your property with confidence and security. When you manage a foreclosed property, the longer it sits empty, the more vulnerable it becomes. It doesn’t take long for intruders to cause catastrophic damage to a building, which is why so many property managers count on DAWGS. Our uniquely secure door and window guards adhere to local property ordinances, ensuring that your properties are always up to code and never at risk for major fines or legal action. By keeping unauthorized persons out, we help you effectively prevent crime, accidents and damage caused by vandalism, flooding and fire. And with our unique security system, you can authorize other people to enter the property even without you there, no keys required. It isn’t just secure—it’s fast, convenient and simple. When you use DAWGS door and window guards, you can manage more properties and worry less. Our rental options give you completely customized solutions for securing your property with DAWGS. Click here to contact our rental services department and learn more about your vacant property security options, or call us at 1-877-88-DAWGS (32947).